There are two things you need for super juicy, flavourful grilled burgers: Fat and seasonings. For the best tasting burgers, choose meat with a higher fat content. For example, pick regular minced beef instead of reduced fat mince, minced chuck, minced round or minced sirloin. If the package labelling doesn’t clearly indicate what you are buying, don’t be afraid to ask the person behind the meat counter to point you in the right direction. On its own, minced beef doesn’t have much flavour, so it is important to add additional seasoning. For this recipe, a combination of sweet Italian pork sausage, salt, pepper, Worcestershire sauce, onion, garlic and fresh rosemary are used to pack a lot of flavour into each bite. As an added bonus, the Worcestershire sauce and onion increase the juiciness of the burger without adding a lot of extra fat. This recipe doesn’t specifically call for bacon, but it is a wonderful addition to the blue cheese and avocado. Clean BBQ grill grates and spray with non-stick cooking spray. Add all ingredients to a large glass bowl and combine thoroughly. Make sure both types of meat and all seasonings are completely incorporated throughout the mixture. Divide meat mixture into 8 equal parts and shape each part into ¾ inch thick patties. Place patties on a lined tray and use your thumb to create an indent in the middle to keep them from puffing up while cooking. Cook patties over direct, high heat on your grill for 8 – 10 minutes. Final cooking time will depend on desired level of doneness and how thick you make each patty. If topping with soft, sliced cheese, add slices about one minute before cooking is complete. 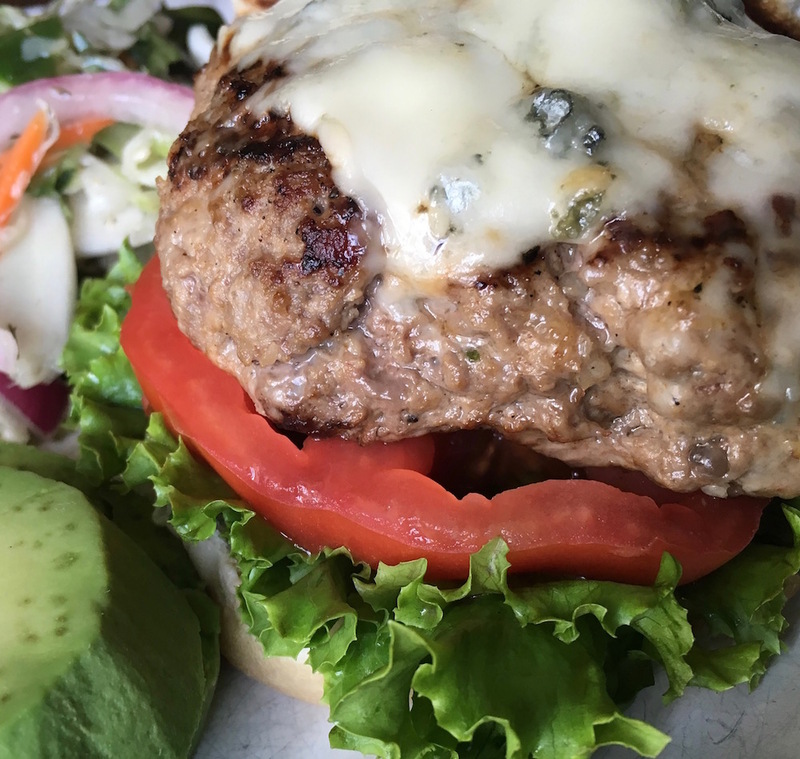 If using a harder, chunky cheese, such as blue cheese, move burgers to indirect heat 2-3 minutes before they are done. Top with blue cheese and close lid to allow cheese to melt completely. Serve on toasted buns with lettuce, tomato, slices of avocado and bacon, if desired – or top with your favourite condiments, instead.